JANUARY 29, 2010  Steamboat Springs band members will warm up their instruments on February 7 for the 2010 Winter Carnival Diamond Hitch Parade, like band students have been doing since 1935. They'll head to the main street of their famous winter resort town and play the school's fight song down the length of the parade route. And they'll do it all while "marching" on skis. Meet the Steamboat Springs H.S. Ski Band. "We have a patch on our uniform that says 'World's First Ski Band,'" said director James Knapp, who has led the band for three years. "We're probably the world's only ski band, but there might be a band somewhere that we don't know about." 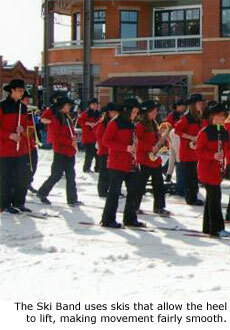 The marching band uses Telemark-style skis which clamp the boots only at the toes and leave the heels free to move. Yet surprisingly, performing on skis is not the biggest challenge the band members face. "It's the cold," Knapp said. According to Weather.com, the average high temperature in Steamboat Springs during February is 33 degrees. The average low is 4 degrees. "We can have sub-zero temperatures," Knapp explained. "For safety, we use plastic mouthpieces and we have the kids hold the mouthpiece in their hand when they're not playing." The band also uses special high-viscosity valve oil that stands up well in cold temperatures and doesn't freeze inside the instruments. During the parade, the band plays frequently to keep warm air circulating through the horns. Knapp says the band members are fond of their unique tradition, even if it means performing in less-than-ideal conditions. "It can be a challenge, but once the students get past the cold and discomfort, it's something they are extremely proud of," Knapp said. These days the 50-member Ski Band has a new look that puts a modern twist on the long-standing tradition. In 2009 the school replaced the tattered uniforms the band had worn for 30 years. Knapp explained that the zippers were broken, the pieces were mismatched, and in general the uniforms were "cold and miserable." Knapp arranged for the band to wear warmer ski coats and Stetson cowboy hats, an update that adds to the comfort of band members and fully embraces Steamboat Springs' reputation as a western ski destination. "A black Stetson cowboy hat with a really cool looking coat. That's better than the uniform I wore in high school band," Knapp said. "It's everything about Steamboat now." The connection with the community goes beyond just the style, Knapp explained. The coats were made by a local clothing company, and the cowboy hats were ordered through a local western outfitter that has been in business for more than 100 years. "Through all the different administrations and band directors, the Ski Band has been a tradition," Knapp said. "But everybody brought a slightly different approach, and for me that was updating the uniforms." For the rest of the year, the high school band trades the plastic mouthpieces for better-sounding metal mouthpieces, and performs in more traditional venues. "We have a strong concert band program and jazz program," Knapp said, noting that they participate in concert competitions and honor bands. They also march in the school's fall homecoming parade, without the skis. The Steamboat Springs Winter Carnival was started in 1914 by Norwegian Carl Howelsen who wanted to add excitement to the region's long winters. The Ski Band was added in 1935 by then-director Jerry McGuare. The event is now sponsored by the Steamboat Springs Winter Sports Club and serves as a fundraiser for various ski programs in the community. The Diamond Hitch Parade is one of several "Street Events" that take place on Lincoln Avenue in the downtown area. The city's Parks and Recreation department hauls in more than 400 tons of snow to cover the street, providing a fresh and clean foundation for the parade and crazy relay races. "The 3-legged race, obstacle course, dog-dash, and dad-dash allow even the littlest of skiers and snowboarders to partake," notes Special Events Director Kara Givnish in a press release from the Steamboat Springs Chamber Resort Association. "Whether cheering on the sidelines or screaming down Lincoln Avenue behind a horse, the events create unforgettable memories." In this Olympic year  the Carnival comes just a week ahead of the 2010 Winter Olympic Games in Vancouver  the community is especially proud of its claim that Steamboat Springs is home to more winter Olympic athletes than any other town in North America. The carnival will hold an Olympic Send-Off on February 5 to honor past and current Olympians, including athletes from the U.S. Nordic Combined and U.S. Freestyle teams. "We have gold medalists and world champion skiiers," Knapp said. "We're sending three or four kids to the Olympics this year. Skiing is such a strong part of our culture." The 2010 Diamond Hitch Parade begins at 11:30 AM on Sunday, February 7. 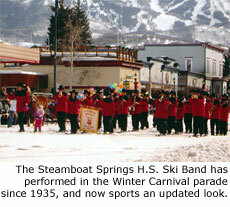 For more information about the Winter Carnival, visit SteamboatChamber.com. Images courtesy of Steamboat Springs H.S. Band.